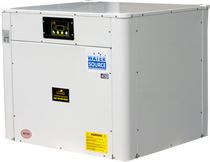 Geothermal heating utilizes a series of water-source heat pumps connected to a heated water source such as a well or a lake adjacent to the pool. The water is pumped either out of the ground or lake whereby it passes through each of the heating units. As the source water passes over the titanium coil, the refrigerant heats to become warm Freon gas. The gas passes through a compressor and is superheated, and then passes through a condenser. The pool water washes over the Freon coil capturing that heat before leaving the unit returning to the pool. As heat transfers from the coil to the pool water, the hot Freon gas cools to once again become cold refrigerant. Green technology applies to a system that uses innovative methods to create environment friendly products. It is primarily comprised of various everyday cleaning products, energy sources, inventions, waste, clothing and a host of others. Green technology uses renewable natural resources that never deplete. That way future generation can also benefit from them without harming the planet.